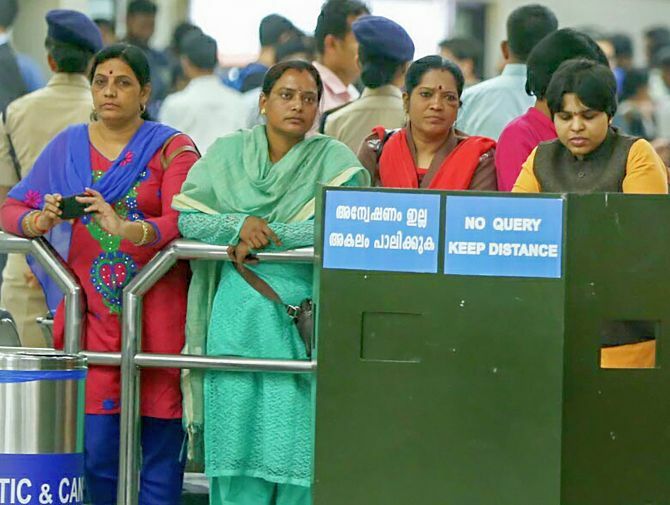 Activist Trupti Desai, who landed in Kerala on Friday, November 15, determined to enter the Sabarimala temple in the wake of the Supreme Court order allowing all women to enter the shrine, has returned to Maharashtra after she was prevented from leaving Kochi airport in the face of mass protests against her. Before leaving for Kerala she had told Rediff.com that she would not return without entering the temple. But seeing the large number of protestors ranged against them, she and her colleagues from the Bhumata Brigade changed their mind. "We took the decision of coming back to Maharashtra because we did not want to upset the law and order situation in Kerala," Desai tells Syed Firdaus Ashraf. "When we reached Kochi airport on Friday, our plan was to stay at Kottayam and from there we planned to proceed to Sabarimala on Saturday. We had anticipated that our entry into the Sabarimala shrine will spark a protest on Saturday, but when we reached Kochi airport thousands of protestors landed at the airport. They warned us not to come out of the airport. The Kerala police, however, told us that we must book a taxi to reach Kottayam which we did, but the taxi driver refused to drive us when he came to know that his taxi would be smashed if he allowed us to sit in his taxi. We then booked another taxi and the same thing happened. Not a single taxiwallah was taking us to Kottayam as they were afraid of protestors who did not want us to enter the temple premise just because we were women. Fed up of waiting for a taxi we decided we will somehow arrange our transport and stay in some hotel in Kochi. But the sad part is that no hotel was taking our bookings as they feared that these protestors will damage their properties too. And then we saw the protestors crowd swelling in more and more numbers, they did not want us to come out of Kochi airport. The police then told us that our presence at the airport was causing a law and order problem as the protestors were getting agitated about our entry in the temple. They were worried that protestors may enter the airport premises and since they were in large numbers, the police themselves won't be able to handle the violent situation. The police further informed us that even if they give us protection, they will not be able to take us to Sabarimala as there is too much of a risk and danger to our lives. When we saw that there were no taxis and no hotels for us to stay, we decided at 6 pm that we will go back to Maharashtra for the moment. We turned back because we did not want to cause any inconvenience to the people of Kerala. The police told us that the next time we must give them our detailed plan and they will ensure that we will get entry into the Sabarimala temple. Now the protestors think that I am scared of entering Sabarimala, but that is not true. I am not scared to enter Sabarimala temple. I feel the protestors were scared of me as they came from all over to Kochi airport. They know that if Trupti Desai can reach Kochi airport, she can reach Sabarimala temple too. These protestors know what I did in Shani Shingnapur and Haji Ali, therefore they came in such huge numbers. We only turned back because we did not want to create a law and order problem, but let me tell these protestors that we will enter Sabarimala temple with guerrilla tactics. I don't feel that my going back to Maharashtra is a setback for women's entry at Sabarimala. Right now, the Sabarimala temple is open for many days and I can go any time. On my next trip to Sabarimala I will come without informing anyone and my visit will be a secret. We will inform only the Kerala government and the police. This is the only way I can enter the Sabarimala temple. So far I have not been able to speak to any Kerala government official, but the Kerala police promised us that they will give us security in Kerala whenever I reach next time. They told us they will need some time to prepare to ensure that I visit the temple because they do not have the required security measures to protect us. I have come to know that there are rumours being spread that I am doing all this at the behest of the Congress party, but that is not true. I have no links with the Congress party. Political parties are trying to defame me because they want to do politics in my name. I am only a social activist. I have also read somewhere that Trupti Desai has converted to Christianity. I am not a Christian, I am a pure Hindu. Why people are spreading such kind of wrong allegations against me, I don't know. I am a Hindu and I love the Hindu religion. Hindu religion gives high status and respect to women. And if there are some reforms in the Hindu religion, then there is nothing wrong in it. I am not trying to hurt Hindu sentiments. I am not an atheist, I am a believer. The Supreme Court of India has given me the right to visit the Sabarimala temple and I am just doing that, so all such fake news is being spread against me just to malign me."